The residential solar business isn't as easy as it once seemed for Sunrun. Sunrun Inc (NASDAQ:RUN) has been one of the best performing solar stocks this year, more than doubling as it grew residential solar installations and competitors struggled with shrinking sales. In the second quarter alone, Sunrun saw installations rise 20% to 91 megawatts (MW), making it the largest residential solar installer in the U.S. But growing installations doesn't necessarily generate value for a company, or its shareholders. And there were some troubling signs in Sunrun's operations during the second quarter. One of the most troubling trends for solar installers over the past two years has been rising sales and marketing costs. They were able to grow through about 2015 on the back of early adopters and other low-hanging fruit, but as the number of homes with solar installed increases it gets harder and more expensive to reach new customers. Sunrun is seeing this challenge in rising sales and marketing costs. A year ago, sales and marketing costs were $0.54 per watt installed, and that increased to $0.69 per watt in the second quarter. That's a troubling trend for Sunrun, and others in residential solar. The other cost trend that isn't encouraging is Sunrun's installation costs for the projects it builds internally, rather than through channel partners. Management has always touted the internal business as a cost-effective way to grow, but installation costs rose by $0.08 to $1.95 in the second quarter. This compares to overall installation costs falling $0.35 to $2.35 for all installations. Mix and geographic location can affect costs, but it's not a good sign if your internal installation costs are going up. Wait, Sunrun isn't adding value? What residential solar companies have always struggled with is determining the long-term value of contracted solar leases. Sunrun tries to determine value with net earning assets, which it says is the total estimated future cash flow from installed assets minus project-related debt. This is a number that should rise consistently each quarter if Sunrun is adding value to its balance sheet. Between the end of the first quarter and the end of the second quarter, net earning assets only increased by $1 million to $1,290 million. At the same time, the estimated value of solar lease renewals -- which estimate the value of non-contracted cash flows 20-30 years after a system is constructed -- built into the net earning assets calculation increased by $63 million to $863 million. If we pull the renewal number out, contracted net earning assets dropped $62 million to $427 million. The projection that customers will renew a solar lease on equipment that's 20 years old is questionable at best. Assuming they'll pay a premium for those aging assets, as Sunrun has built into its valuation model, is overly optimistic. I think investors should only consider contracted value added to Sunrun's business, and that's a number that's going in the wrong direction. Sunrun's business is built on the idea that it can sign a customer to a long-term lease and then sell a portion of the cash flows to investors for the same as, or more than, it cost to build a project. That model works well when interest rates are low and investors have low return expectations, but as interest rates rise it'll reduce the amount of money Sunrun can sell cash flows for. 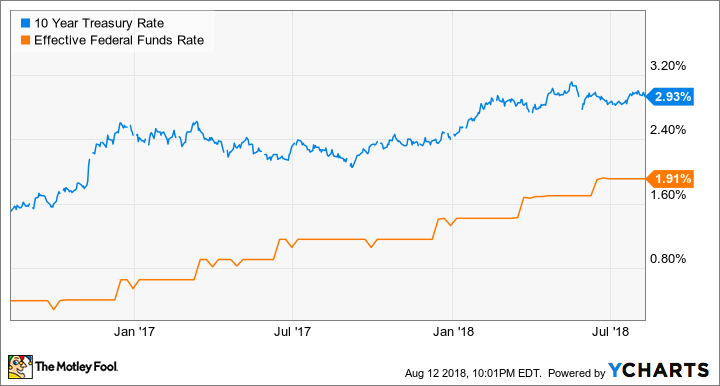 You can see below that both the 10-year Treasury rate and the Federal Reserve Funds rate, which drives short-term interest rates, have been steadily climbing over the last two years, which isn't a good trend for Sunrun. Some of the falling value metrics I pointed out above can be accounted for by the rising cost of selling project cash flows to debt providers. But given the current economic environment, there's no indication rising interest rates won't continue. There's no question the residential solar industry is facing challenges that will hurt big installers who finance projects long-term. Rising interest rates, higher sales, costs, and tariffs on imported solar panels and metals are hurting all installers, but as the largest Sunrun will feel it the most. It looks like investors are realizing these headwinds may take a bite out of long-term earnings, and that's why the company's stock is falling.